John Sopinka was born in Broderick, Saskatchewan, on March 19, 1933. He was the son of Metro Sopinka and Nancy Kikcio. In 1941 his family moved to Hamilton, Ontario. He studied at the University of Toronto, earning a B.A. in 1955 and an LL.B. three years later. From 1955 to 1958, while working on his law degree, he played professional football with the Toronto Argonauts and Montreal Alouettes of the Canadian Football League. He was called to the bar of Ontario in 1960, and was later called to the bars of four other provinces and two territories. He practised law in Toronto for 28 years, first with Fasken & Calvin and then with Stikeman, Elliott. During that time, he also lectured on law at both Osgoode Hall Law School and the University of Toronto. He is the author of several legal works, including The Trial of an Action, and co-author of The Law of Evidence in Canada. Appointed to the Supreme Court of Canada on May 24, 1988, he served on the Court for nine years. 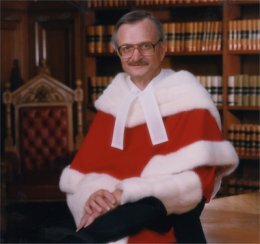 Justice Sopinka died on November 24, 1997, at the age of 64.